If you are in the middle of planning the biggest day of your life, by now you probably realize just how much there is to do. From choosing a theme to sending out the invitations and choosing the band, the list can seem endless. But a truly successful wedding hinges on the little things far more than the big ones. For example, have you considered what type of wedding exit strategy you are going to have? The most common exit continues to be having the guests throw rice or confetti at the happy couple as they walk out of the church. However, both of these tend to have negative connotations such as leaving a mess behind or being harmful to birds and other wildlife. 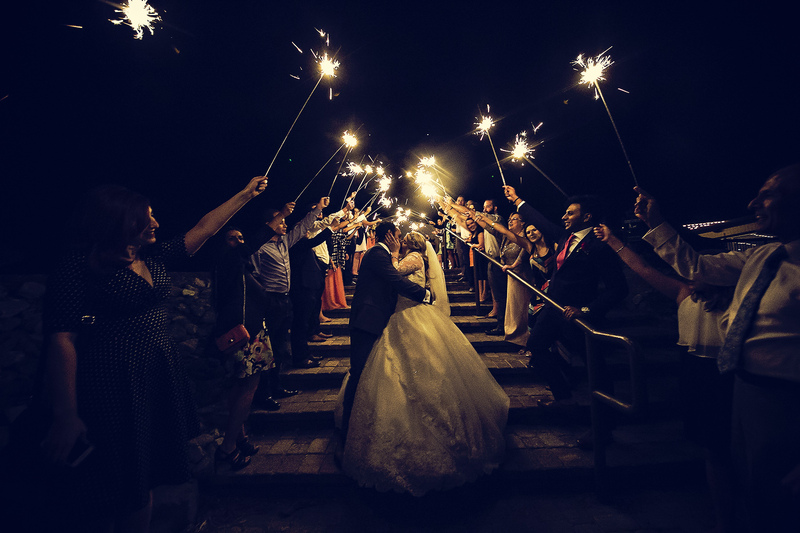 Why not treat your guests to the ultimate in modern wedding exits by giving each of them wedding sparklers they can light the moment before you and your new spouse exit the church or wedding venue? Wedding sparklers are very similar to those given to children for the 4th of July and that most of us use to help bring in the new year. The big difference is that the sparklers for sale intended to be used at weddings are much bigger and tend to burn a little brighter. They range in size from 10 inches long to 36 inches long and come in a variety of colors. Burn times range from 45 seconds for 10-inch sparklers to 3.5 minutes for 36-inch sparklers. Not only are wedding sparklers a great way to create a modern wedding exit, but they leave absolutely no mess behind. Once the sparklers have burned out, they can be placed in a bucket of water to cool before being deposited in a trash can for disposal. It just doesn't get any easier than this and best of all, the majority of the sparklers for sale today are safe enough for younger children to use with supervision. Since you are trying to create your own unique modern wedding exit, perhaps the idea of standard straight sparklers doesn't sound all that appealing. If this is the case, we encourage you to try something a little different. We also carry heart-shaped sparklers that burn with bright gold sparks for up to 50 seconds. These sparklers are 11 inches long and have a long handle section to help keep hands away from the heat as the sparkler burns. Remember, it's your wedding so be sure to include wedding sparklers as part of your exit strategy. They are an amazing way for you to create a memorable occasion for you, your spouse, your family, and all of your guests from the youngest to the oldest.